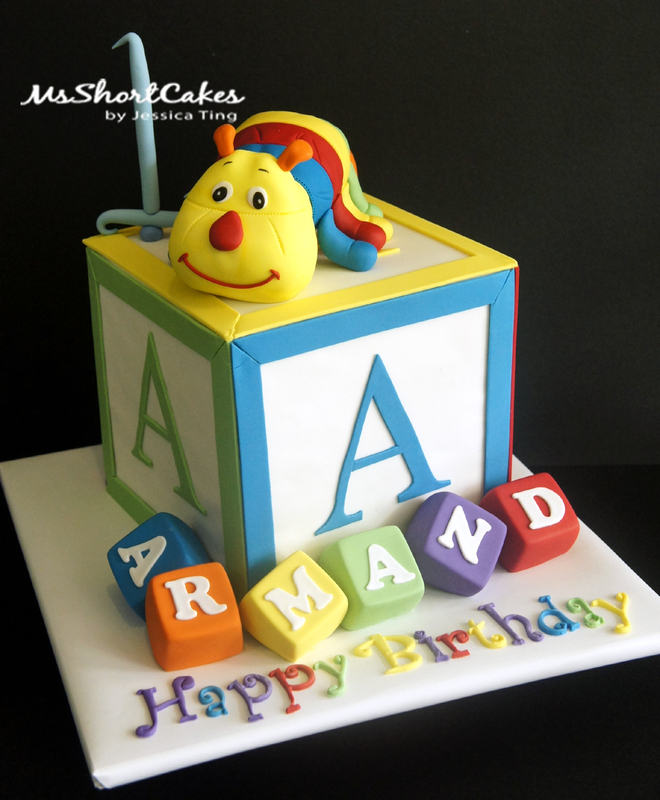 Yet another cute cake to share with everyone…this time it’s a caterpillar cake! I have never done a caterpillar cake before, and I was super excited to get this project! Ok rewind – An old, old, old friend of mine from school contacted me awhile back, enquiring about a cake for her son’s 1st birthday. She was open to a lot of ideas and didn’t really know what she wanted exactly. So I asked her, if her son had anything that he could relate to, or anything that makes his eyes light up. “Perfect”, I thought. So she sent me a few photos, and it was so cute and colourful. 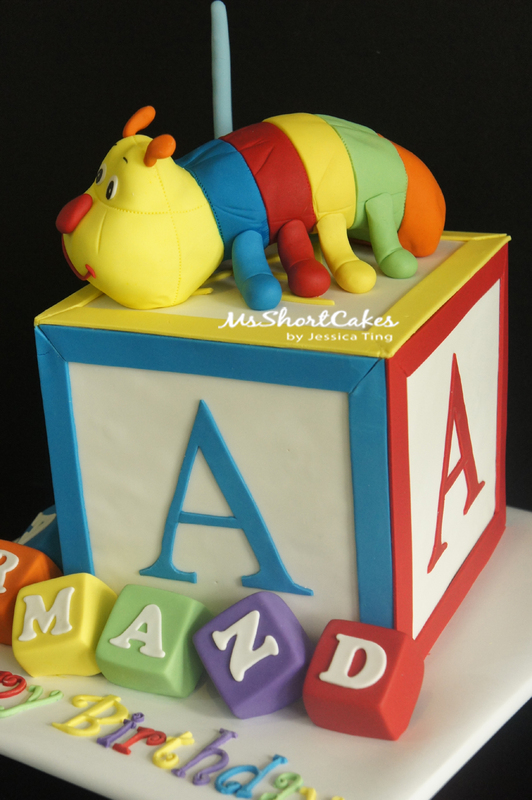 I decided to put the caterpillar on top of a giant-sized name block “A”, and to personalise it, put his name in mini-name blocks on the cake board, as well as a number 1, to show his age. 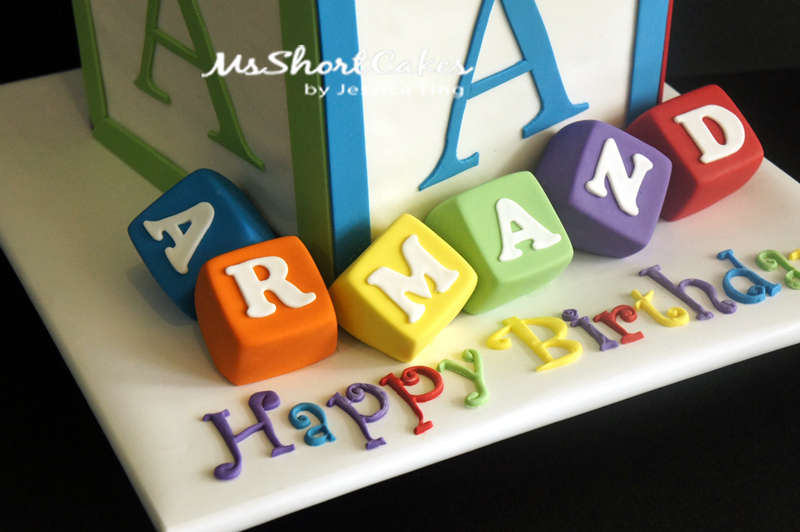 The name block cake was made from 2, 7″ square cakes, which I stacked together, and strangely enough, after filling and ganaching the cakes together, the total height was a perfect 7″ tall, too! That never, ever happens! So I didn’t have to trim anything else off, and all I had to do now, was to ganache the entire cake. The four sides of the cakes had “A” cut out in different colours, and what I loved about this cake, is that my friend’s family’s names all begun with the letter, “A” – and there were 4 of them as well! So perfect.